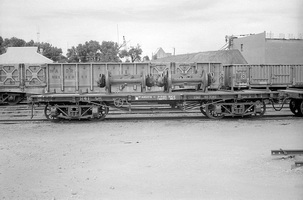 Flat wagons built by "Clyde" for use during construction of the line, 35 foot long over couplers and coded "R". 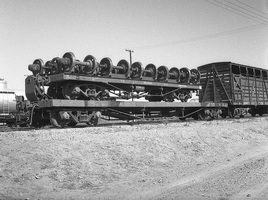 Flat wagon, 35 foot long over couplers. 22.3.1978 Converted to "VGA" Mobile power unit. 1943 Altered to "RT" for conveyance of armoured fighting vehicles. 10.7.1978 Written off - sold to Western Australian Government Railways. 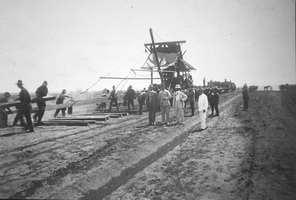 c.1913 Converted to carry the Track Laying Machine. c.1917 Converted back to "R" flat. 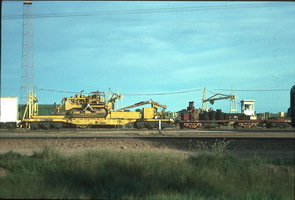 5.1981 On Central Australia Railway . 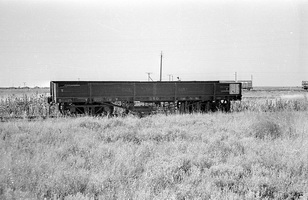 24.1.1972 Converted to "WR" rail laying wagon. 5.1.1914 Fitted with 6400 gallon water tank - coded "TC 6". 22.12.1948 Converted to "VB" covered goods. 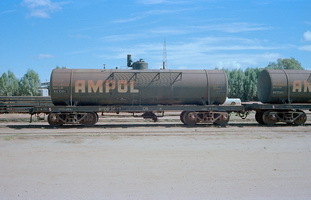 21.12.1949 Petrol tank fitted to wagon and recoded "TOA" (5,000 gal C.O.R tank No.118). - Used for track panels. - Converted to 4 wheel ballast spreader "BP". - Converted to "G" open wagon. 5.4.1934 Converted back to "R" flat. 11.2.1949 Converted to "VB" covered goods. 5.1981 Reported as being at Woocalla Ballast pits. 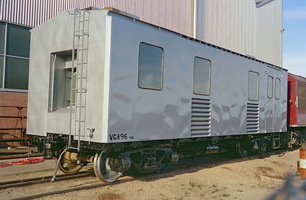 24.11.1977 Converted to "VGA 17" Mobile power unit. 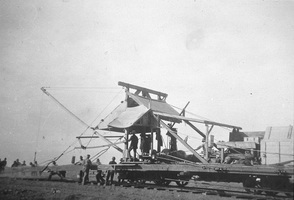 c.1914 Converted to carry the Track Laying Machine. - Used to carry 16 single water tanks. - Fitted with 6400 gal water tank. 1974 New tank fitted to wagon (owned by B.P). 17.6.1952 Petrol tank fitted to wagon and recoded "TOA" (owned by VACUUM). 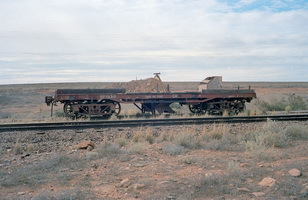 22.12.1933 Converted back to "R 30" flat wagon. 1917 Converted to 33 foot pay car with dining and sleeping facilities. 15.2.1951 Allocated code "E 31". 2.2.1974 Exterior painted, new roof. - Converted to petrol tank fitted to wagon and recoded "TOA" (owned by VACUUM). 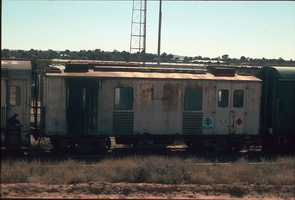 8.1978 Written off - sold to Western Australian Government Railways. 26.1.1978 Fitted with water tank wagon converted to standard gauge "TM 33". - Converted to Employees "EB" van. 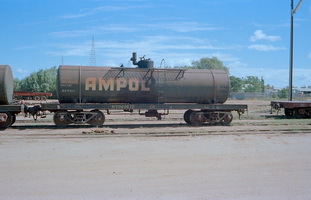 - To petrol tank fitted to wagon and recoded "TOA" (owned by C.O.R). 6.11.1948 Petrol tank fitted to wagon and recoded "TOA" - tank OB65 Petrol COR (later Tank 115). 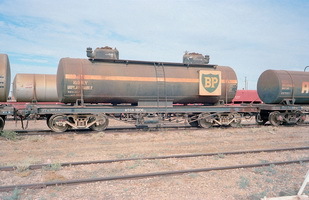 1.1984 Tank and bogies donated by BP Australia to Steamtown Peterborough, underframe remained property of Australian National. 1977 Converted to "VGA" Mobile powerhouse. 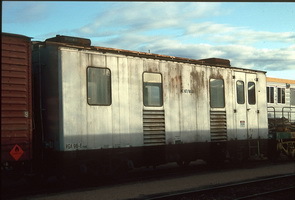 5.1981 Noted fitted with work hut "R 38". 18.6.1951 Petrol tank fitted to wagon and recoded "TOA" (owned by VACCUM). 5.9.1977 Tank removed and place on "TG 495", underframe mounted with camp unit "S 102", recoded "R 39". 1.12.1939 Converted to "G 43" open goods. 28.9.1951 Converted to "F 884" refrigerator wagon, body ex North Australia Railway "NFA 1720". 1.1965 Sold to the Western Australian Government Railway as part of a group of 64 standard gauge wagons. 1943 Altered to "RT 44" for conveyance of armoured fighting vehicles. 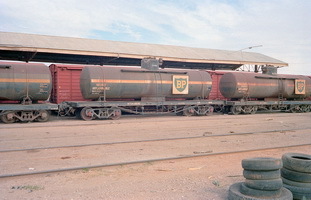 28.2.1949 Converted to "VB 44" covered goods. - Converted back to "R" flat. 26.5.1958 Converted to ballast plough "BP 1534". 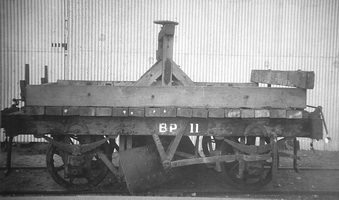 10.5.1958 Converted to ballast plough "BP 1534". 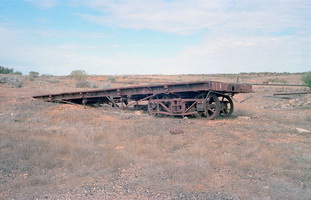 Note: A second flat wagon called "R 48" was converted from Hospital car "O 48"
9.6.1964 Sold to the Western Australian Government Railway as part of a group of 64 standard gauge wagons. 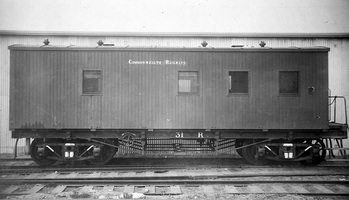 before 1915 Converted to temporary cattle wagon. 13.9.1978 Sold to Western Australian Government Railways. - Fitted with 9000 litre tank and coded "AZTL". 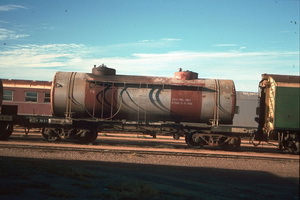 10.7.1978 Sold to Western Australian Government Railways. 5.8.1914 Fitted with 6400 gallon tank - coded "TC 57". 1.12.1939 Converted to "G" open goods. 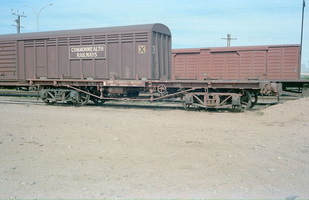 27.2.1951 Converted to "F 885" refrigerator wagon, body ex North Australia Railway "NFA 4666". 10.6.1971 Converted to narrow gauge North Australia Railway "NTD 1744". 28.11.1977 Returned to standard gauge fitted with water tank wagon recoded "TM 885". 1977 Converted to flat as "R 57". 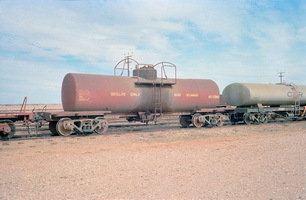 2.3.1978 Sold to Western Australian Government Railways. 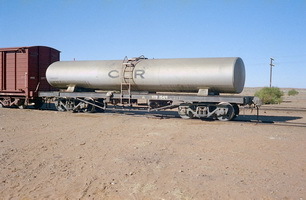 21.12.1949 Petrol tank fitted to wagon and recoded "TOA 60" (5,160 gal C.O.R tank No.118). - At some stage it seems to have been fitted with tank "DD 70" tank No.117"
8.1.1972 Underframe written off - tank moved to underframe of "TC 7964" and given code "NTOA 1765". 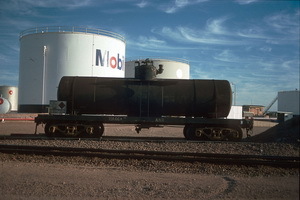 10.3.1954 Petrol tank fitted to wagon and recoded "TOA" (owned by Mobil). 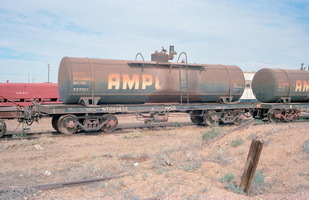 29.11.1950 Converted to "NFA 1181" refrigerator wagon, body ex North Australia Railway "NFA 4739". 12.1950 Converted to "NFB 1178" due to a numbering problem. 29.12.1950 Converted to "F 882". 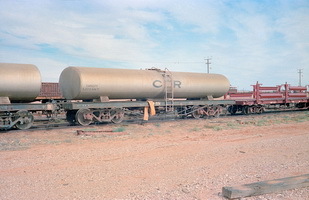 5.1981 Tank wagon, on Central Australia Railway. - Fitted with water tank wagon, converted to narrow gauge North Australia Railway "NTD 1550". 16.11.1977 Recoded "TM 70" tank wagon. 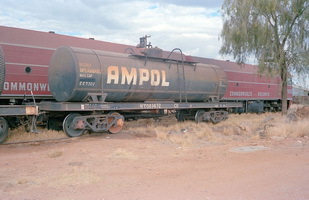 19.9.1950 Petrol tank (ex "R 230") fitted to wagon and recoded "TOA 74", (owned by VACCUM). 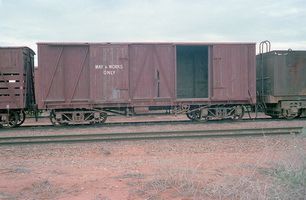 29.3.1951 Converted to "F 883" refrigerator wagon, body ex North Australia Railway "NFA 4879". 20.10.1914 Fitted with 6400 gal water tank - coded "TC 77". 1958 Fitted to carry portable containers. 1977 Converted to "RA 78" flat. 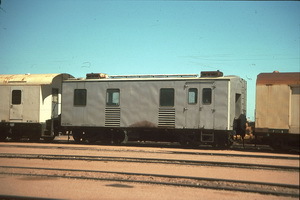 2.3.77 Converted to "VGA 78" Mobile powerhouse for use at "Forrest". 24.1.1949 Converted to "VB" covered goods. 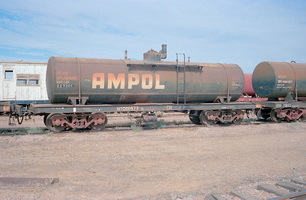 19.5.1978 Sold to Western Australian Government Railways. 7.11.1969 Fitted with work hut "LS 80". 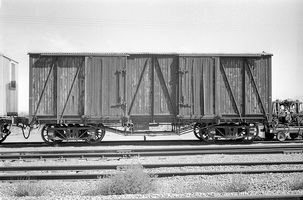 17.7.1951 Converted to "F 886" refrigerator wagon, body ex North Australia Railway "NFA 4870". 1951 Recoded "NFB 1179" due to numbering confusion. - Recoded "XR" for use on accident train. 2.9.1976 Converted to "VGA" Mobile power unit. Contains two GM 6/71 diesels driving alternators for use as mobile power source for camp trains. 1987 Given asset number "NC87/809". 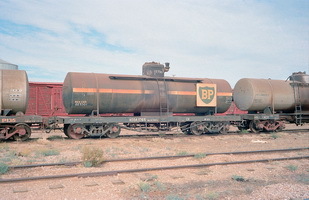 28.6.1968 Converted to Match Wagon "XR 98" for use with "XRA 1967" Port Augusta accident train. 5.3.2011 ARTC issued tender for sal of item. - Converted to "G 99" open goods built. 15.1.1970 Converted to "R 99" flat - fitted with camp unit "S 87".